TIG machines used for arc welding copper utilize electric current and not flame to join copper. These machines may pose electrical shock, burns as well as fire dangers so welders have to enforce as many precautionary measures as they can when using one. Unlike other activities that can have most to least level of danger, the following precautionary measures need to be given an equal amount of import when being enforced. Before you leave the welding machine for the day, make sure that the last user has disconnected it from its power source. In case, you cannot remove the arc welder from its plug, be sure to cut the electricity to the arc welder at the source. You should never check or work on the maintenance of a machine that can be powered on. Since the copper TIG welding machine uses wires, constantly inspect them for wear and tear or damages, especially the surfaces. Any opening must be covered first before using the machine. Also, do not utilize a copper arc welder that is obviously damaged. In the event that the arc welder does not have a properly configured ground, machine users and those exposed to the machine may be exposed to severe electric shocks. Normally, the plan for grounding a welding machine involves running a wire attached to the arc welder to a metal rod that is buried in the soil. Fumes that come from burning copper can affect welders within a short span of time. So in the event that you cannot open the door, a window or the ventilation, ensure that air still flows away from you as well as the welding machine. This must be done constantly especially if you or the welder is using some gas-powered generator to supply the copper TIG welding machine with electricity. Thoroughly inspect the workstation and be sure to take out any material that is highly flammable. You do not like to have things that can easily catch fire near the site of the welder’s machine. Do not ever do copper welding jobs alone. There should be at least one other person that is designated as the fire watcher in the least possible risk of a fire. This minimum number increases as the possibility for danger heightens as well. Copper is easily flammable. So make sure that the standard fire extinguisher is within easy access and is operational. Do remember that humans are flammable, too. So protect yourself from this possibility by putting on a long sleeved shirt, pants as well as leather boots. Your clothes are best if they fit close to your body. Wear flame resistant fabrics whenever possible. A welder’s apron is also recommended especially if you need to work a job that exposes you to high temperatures and/or flammable metals like copper. Do not bring any cigarette lighters or matchsticks inside. A hard hat is not a decorative gear in the welding shop. It keeps sparks out of the welder’s hair. Likewise, a pair of goggles or a face shield with darker than shades tint will protect the welder’s eyes from momentary blindness as well as long term injury. At the very least, hands must be covered with thick leather gloves. The ones that cover hands to the forearms are best when utilizing a TIG welding machine. 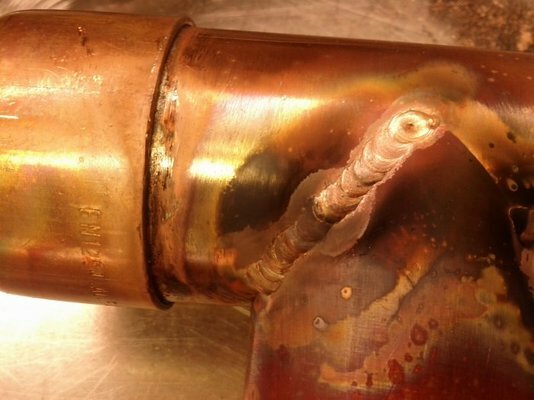 RELATED POST: Does Cold Pressure Welding Really Work? When you are effectively working on a copper welding project, you ought to make sure you choose and work with the right welding tools. From the different prep tools and moldings to the TIG welder that you are going to use, there are a couple of factors you should take into account prior to beginning with any kind of work. 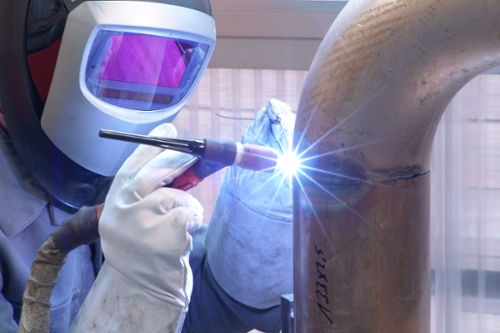 Opting the right welder and using the right temperature and heat settings, are a couple of things you have to consider when you are working on any project. Miller Welders vs. Lincoln Welders: Which Brand of TIG and MIG Welder Should You Choose?